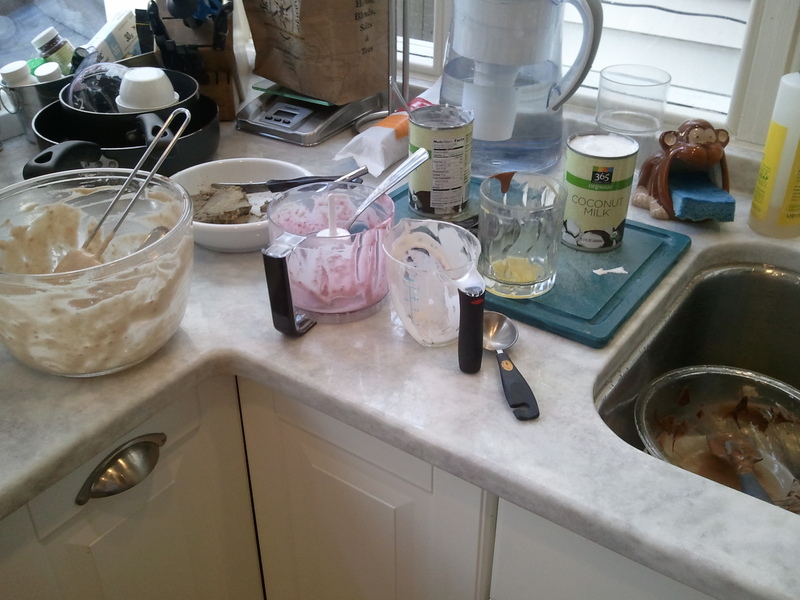 It’s summer now and baking makes the house quite warm. 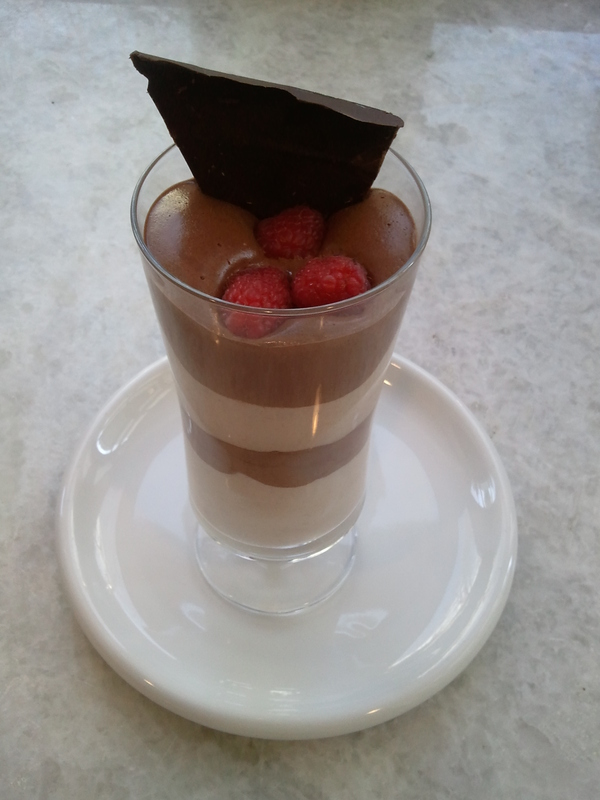 Mousse is a delicious, non-baked dessert for the summer and the brittle adds contrast in flavor and texture. The recipe, as I present it, makes 5 large servings of mousse – halve the recipe for a more proportionate dessert, or go balls to the wall and enjoy (I did the latter). You’ll want to make the brittle first, giving it plenty of time to cool in the freezer. The mousse will also need time to chill in the freezer or refrigerator, so be sure to give it plenty of time to chill ( I’d recommend at least 1 hour prior to serving). Next, make the caramel. 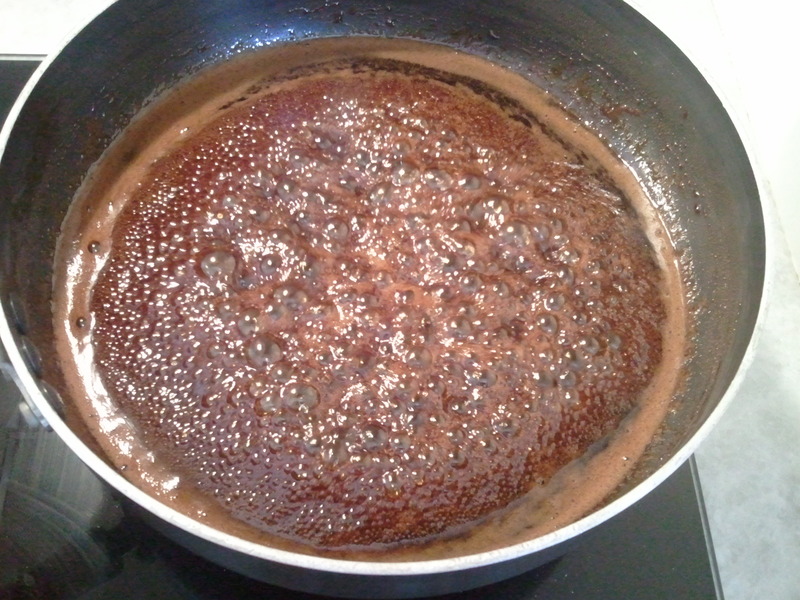 Add the coffee and vanilla to a saucepan, along with the palm sugar. Bring the mixture to a rolling boil, whisking gently along the way. After the mixture comes to a rolling boil, reduce the heat to medium. The mixture will continue to boil, but mildly. 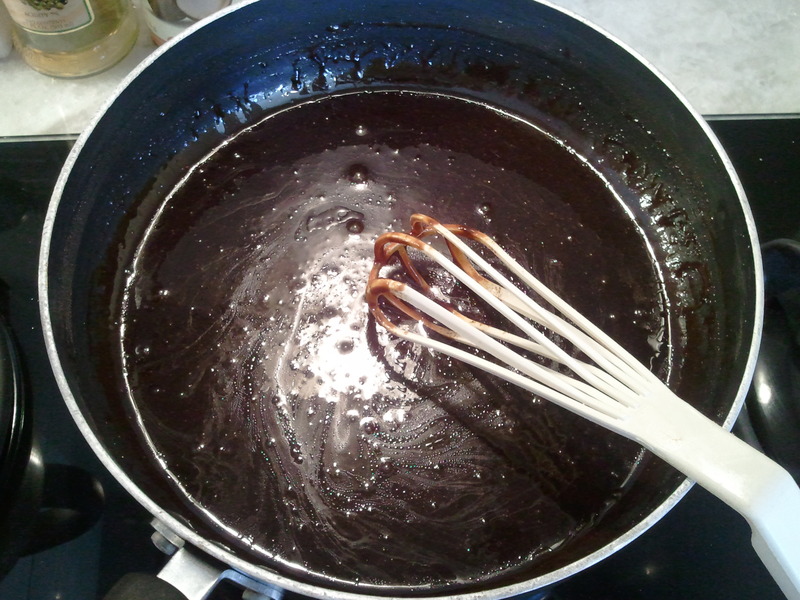 Continue to gently whisk until the mixture deepens significantly in color and thickens. This can be 5-8 minutes depending on your stove and saucepan. On a gas stove, medium sized burner, medium heat, this took me about 8 minutes. 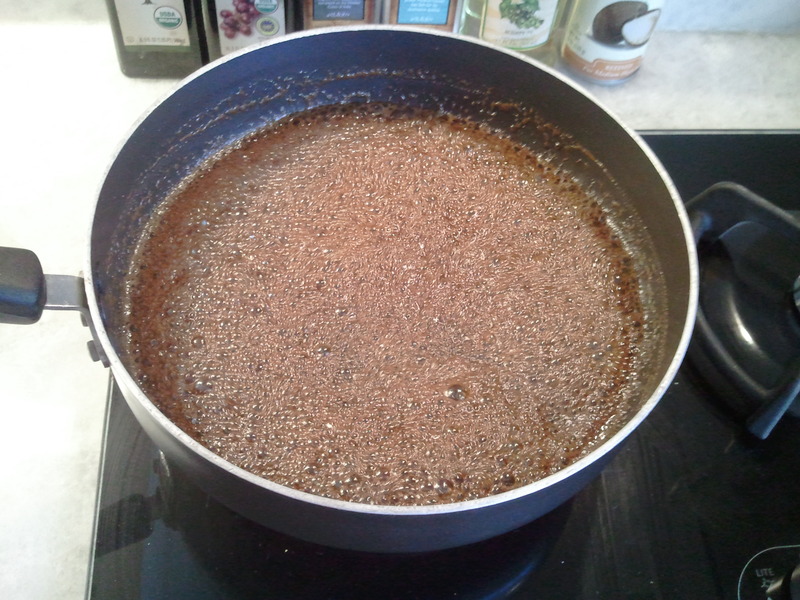 Now, to finish off the caramel, add salt, ginger, cinnamon, and ghee. 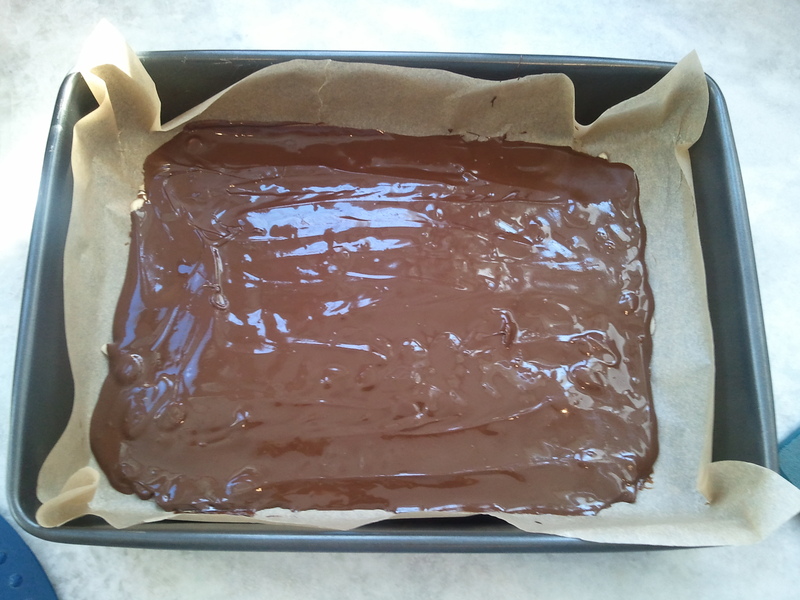 Pour the caramel onto the baking sheet and spread out across the sheet. 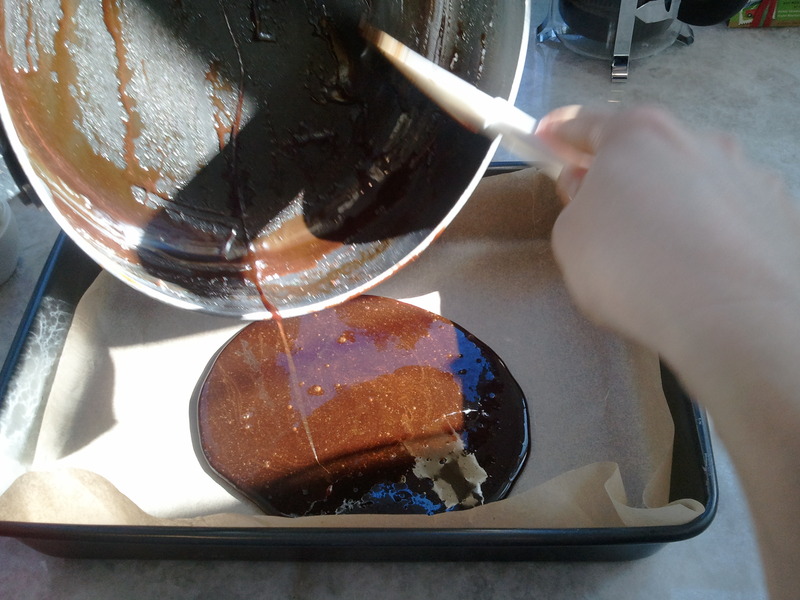 Place the caramel into the freezer to harden. 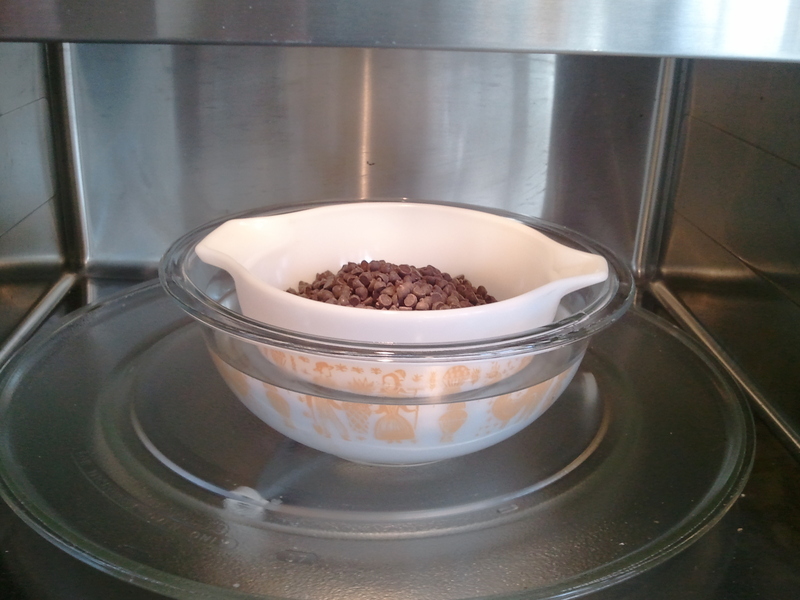 Now, melt the chocolate chips. If you have a double boiler, use that. I don’t – so I used the microwave (which took about 4 minutes – I stirred every 1 minute) 😉 Pour and spread half of the chocolate over the chilled caramel. 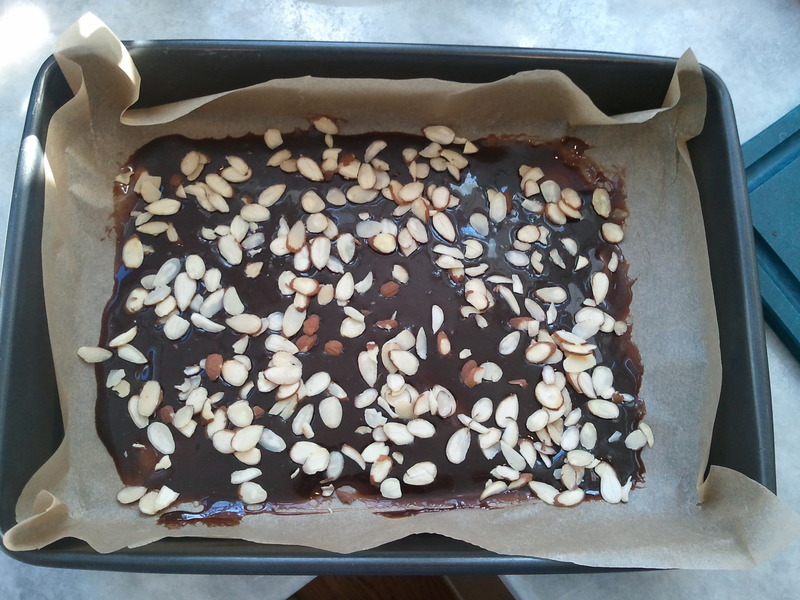 Sprinkle the sliced almonds over top of the chocolate layer. 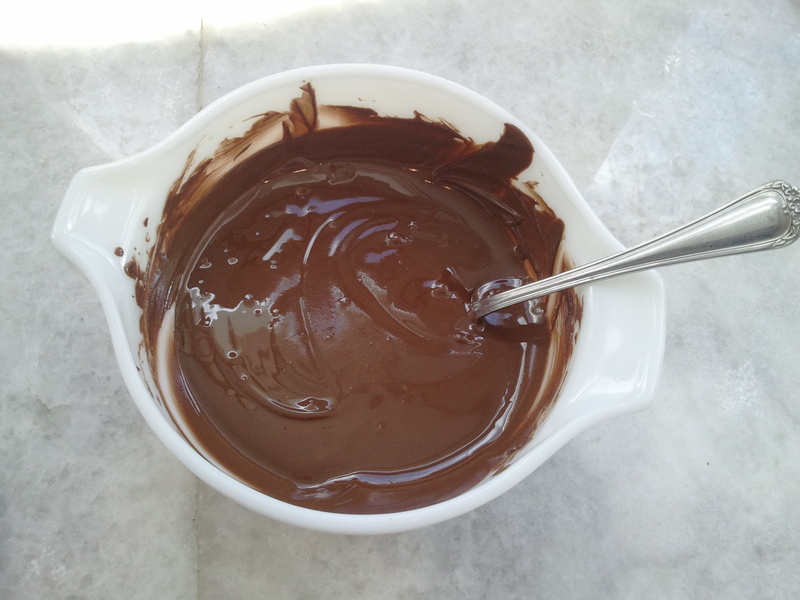 Pour and spread the remaining melted chocolate. Now, place the baking sheet back in the freezer. 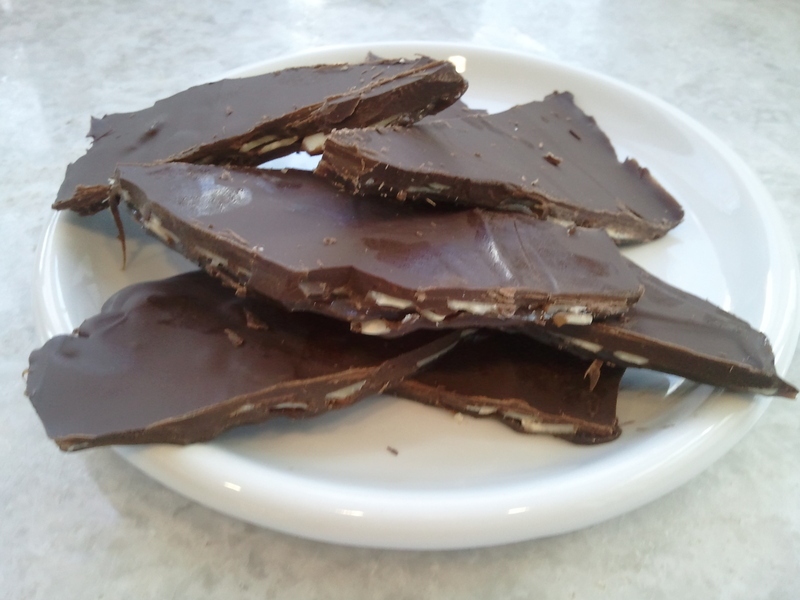 Allow the brittle to chill for at least 30 minutes, longer if you’re able. This will ensure a firm and “brittle” brittle. Once the brittle has been thoroughly chilled, cut it into pieces. I prefer wedges. These will be used to garnish the mousse. Okay, the brittle is done and now we can move onto the mousse. To be honest, I’ve made two versions of the mousse – one with chocolate and raspberry layers, and one with chocolate and peanut butter layers. Keep in mind, you are splitting the coconut cream, eggs, vanilla, palm sugar, and tapioca flour between the chocolate and flavored mousse. For the chocolate mousse, heat 1 t. vanilla and the coconut cream in a saucepan over very low heat and heat for a few minutes until the chocolate melts into the coconut cream. 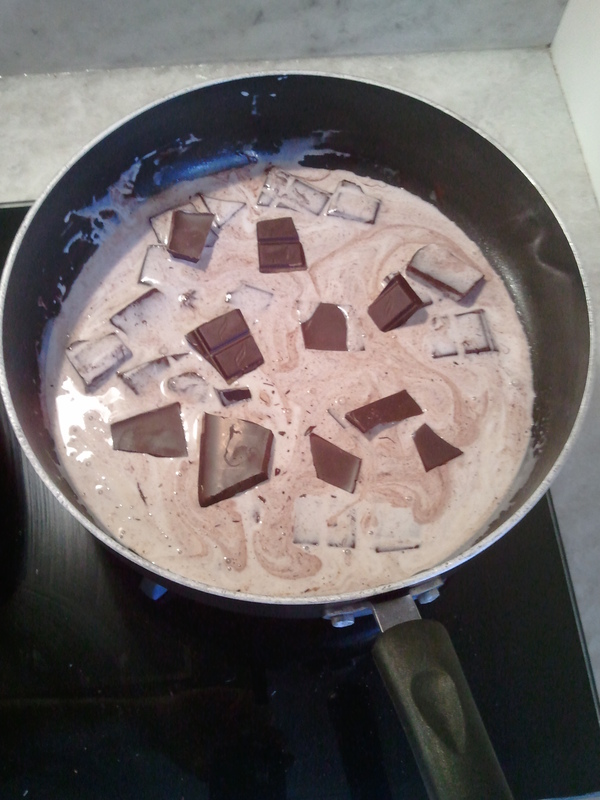 Stir the mixture a few times while the chocolate melts. Be sure to keep the heat on low, so the cream and chocolate do not burn. Whisk 3 egg whites with 2 T. of palm sugar until soft peaks form. 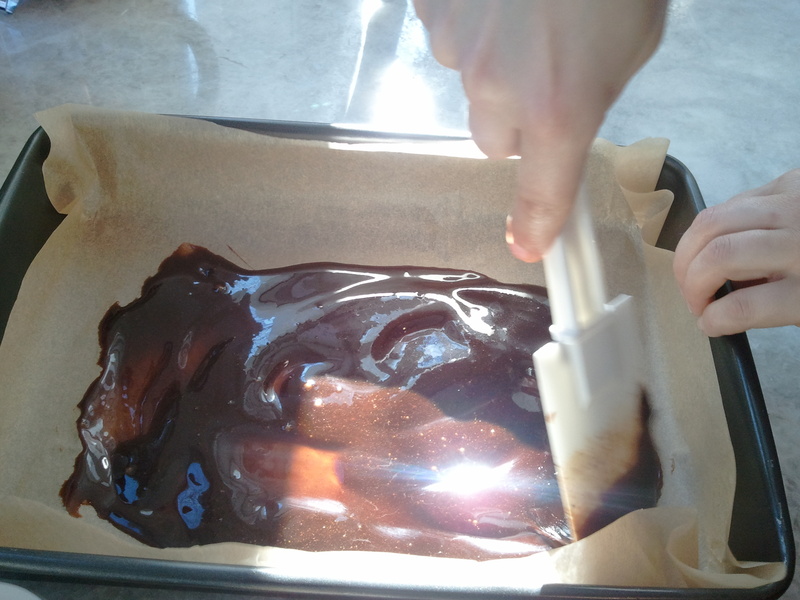 Once the chocolate is fully melted and mixed with the coconut cream and vanilla, allow it to cool a bit. 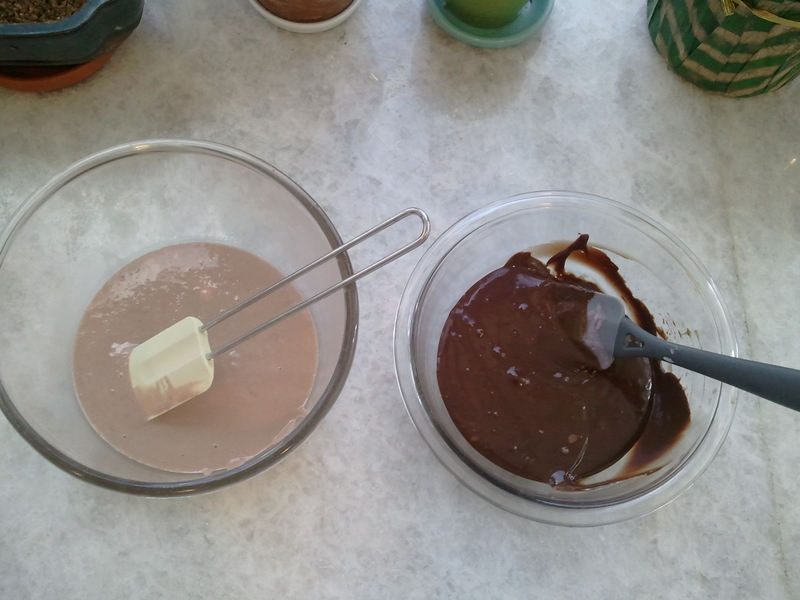 Add small amounts of the chocolate mixture to 3 egg yolks, allowing the temperature of the yolks to raise slowly (you don’t want them to scramble). Finally, fold in the egg whites until there is no trace of egg white. 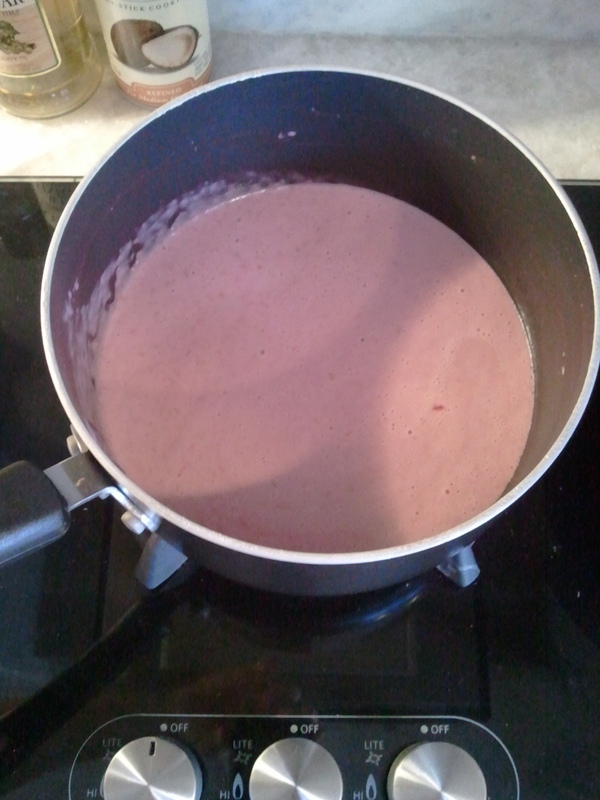 Now, for the raspberry or peanut butter mousse, , heat 1 t. vanilla, 4 T. tapioca flour and the coconut cream (and the bourbon and PB2 for the peanut butter mousse, 1 c. of pureed raspberries for raspberry mousse) in a saucepan over very low heat and heat for 3-5 minutes until the the mixture thickens significantly. 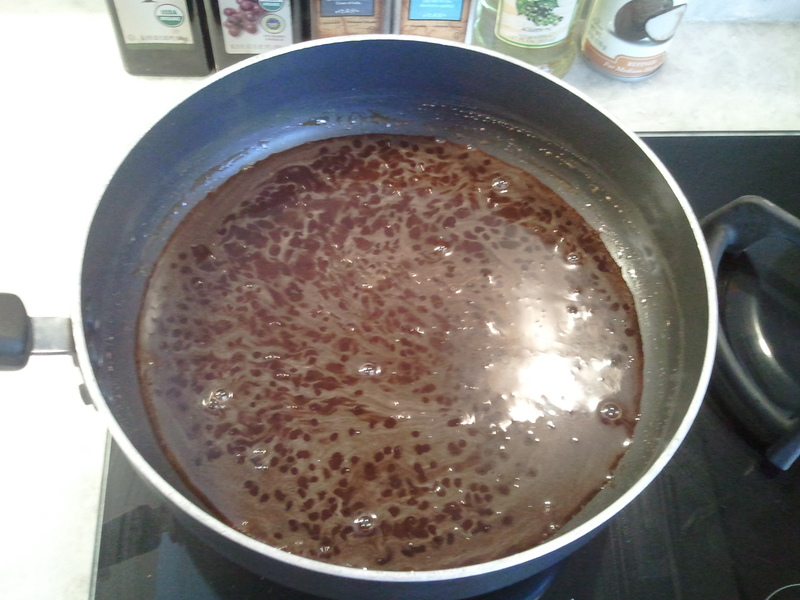 Stir the mixture a few times while heating. Again, be sure to keep the heat on low, so the cream mixture does not burn. Again, whisk 3 egg whites with 2 T. of palm sugar until soft peaks form. As before, add small amounts of the raspberry or peanut butter mixture to 3 egg yolks, allowing the temperature of the yolks to raise slowly (you don’t want them to scramble). Finally, fold in the egg whites until there is no trace of egg white. Finally. layer the mousses in a tall glass. Drop berries into the layers for a fun surprise. Add brittle at the end for garnish. 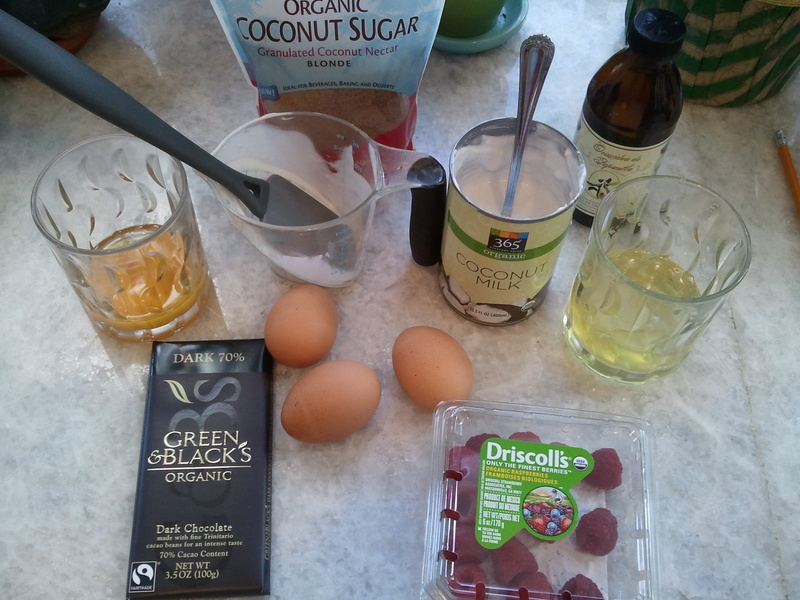 Place the glasses in the refrigerator or freezer for more than 60 minutes, allowing the mousse to fully chill and set. But I can guarantee that this mousse will not disappoint! 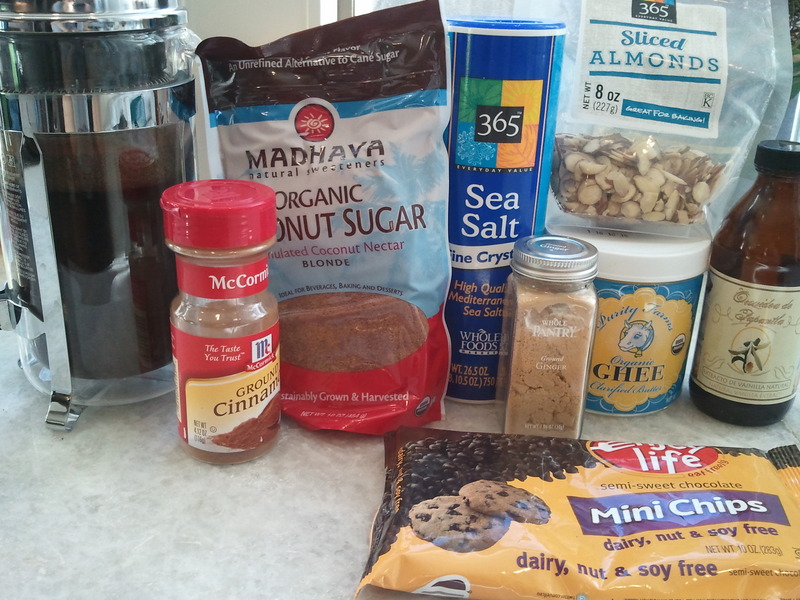 This entry was posted in chocolate, dessert and tagged almonds, brittle, chocolate, coffee, mousse. Bookmark the permalink.